Whether your goal is to share little-known or misunderstood information, work to create policy changes, or raise awareness about a pressing social issue, this book will help you start communicating with the public and share your research with a broader audience. 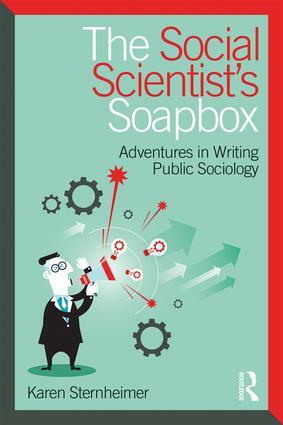 Using examples from social scientists who have successfully navigated the public sphere, as well as firsthand accounts of the ups and downs of the writing, publishing, and promoting process, The Social Scientist’s Soapbox: Adventures in Writing Public Sociology presents readers with a step-by-step guide to get started, stay motivated, and complete both large and small writing projects for public audiences. Now, more than ever, social scientists need to share our ideas with the public, as misinformation, disinformation, and outright lies have filtered into the public discourse and policymaking. Why Write for the Public? Karen Sternheimer is a sociologist at the University of Southern California, where she is a distinguished fellow at the USC Center for Excellence in Teaching. She is also the author of Pop Culture Panics: How Moral Crusaders Create Meanings of Deviance and Delinquency (2015), Connecting Popular Culture and Social Problems: Why Media is Not the Answer (2013), Celebrity Culture and the American Dream: Stardom and Social Mobility (2011), Kids These Days: Facts and Fictions About Today's Youth (2006), It's Not the Media: The Truth About Pop Culture's Influence on Children (2003), and is the editor and lead writer for everydaysociologyblog.com. She has provided commentary for NPR, CNN, MSNBC, The History Channel, and Fox News.